A multimillion dalasi state-of-the-art Swiss Boutique Hotel was on Friday 24 November 2017, inaugurated at a colorful ceremony held at the hotel grounds in Bijilo. The hotel was built by a Gambian businessman, Sainey Manneh, who has been domiciled in Europe for ages but has decided to come back and contribute his quota to national development. In his statement, the General Manager, Sainey Manneh, described the event as monumental day in the history of the tourism industry of the country. According to Mr. Manneh, the Swiss Boutique Hotel, as the name implies, is a 5-star Hotel facility underpinned by quality service delivery and boutique service standards. 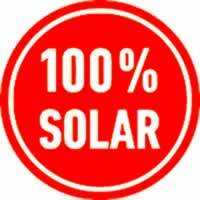 As an Eco-tourism facility, the Swiss Boutique Hotel, is 100% solar powered in line with the tourism related Sustainable Development Goals (SDGs) of the United Nations. 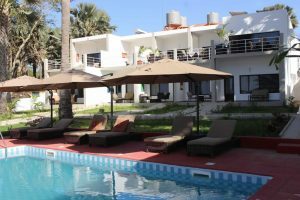 He disclosed that the Swiss Group currently operates two hospitality facilities in The Gambia: the Swiss Boutique Hotel and the Swiss Tarven Bar and Restaurant. Mr. Manneh also stated that it was their vision to not only contribute to enhancing the number of 5-star Tourism and Hospitality facilities in the country, but to equally spearhead and pioneer the attraction of a record number of Swiss nationals to the smiling coast of Africa in line with the objectives of the Gambia Tourism Board to increase the number of tourist arrivals into destination Gambia. He cited that the aspiration of the Swiss Group strategically dovetails into the strategic intent of the ministry and the Gambia Tourism Board plans of increasing the number tourist arrivals. According to the General Manager, in the process of developing the Swiss Boutique Hotel, as management and proprietor of the Group, they have undertaken to finance the improvement and road worthiness of the road from the highway leading to the gates of the hotel. He said there was need for the private sector to complement the efforts of government, as the government alone could not do it all. He challenged the Gambia Tourism Board and the National Roads Authority to complement the initiative through tarring the road and equally providing lighting of the street leading from the highway to the hotel. According to him, the management of Swiss Boutique Hotel would like to assure the public that it will to do everything possible to ensure the sustainability and further improvement of the hotel. Mr. Manneh also acknowledged the support received from the Gambia Tourism Board at the time of his application for allocation of the piece of land. He further recognised the support of the former honorable Minister of Tourism Benjamin Adam Roberts and assistant District Governor Minyan Jobe for their valuable support in the actualization of the project. In his official inaugural statement, the Director of quality and licensing at the GTBoard, Momodou Bah, said everything started in a very rough footing, but thank God the dream has become reality for the benefit of the country. He said the products could speak for themselves and these were high quality products in the country and expressed his pride to have a facility like that. We invite you to enjoy your luxury holiday in comfort at Swiss Boutique Hotel in the Gambia, West Africa. The ethos of the hotel is to provide luxury accommodation in a socially and environmentally responsible way. The Gambia has developed into a world class tropical paradise & luxury tourist destination with five star accommodation; fantastic beaches; great night life; bird watching and nature safaris to see monkeys, crocodiles & hippos; river and sea fishing; golf; and a wealth of African cultural experiences. 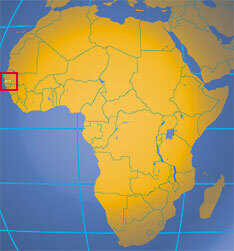 If it’s sea, sun & sand you are looking for the beaches in The Gambia are some of the most picturesque in Africa. If it's nature you want, The Gambia is the perfect place to explore African bird & wildlife watching. Drive from Banjul International Airport to the Turntable in Brusubi.